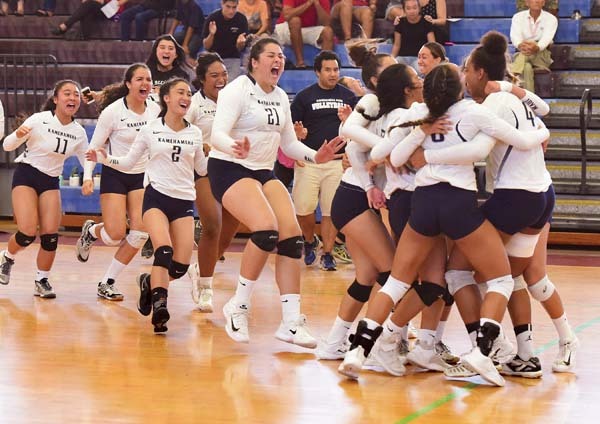 WAILUKU — After the players got their medals, the Kameha­meha Schools Maui and King Ke­kau­­like girls volleyball teams gathered near midcourt at Jon Garcia Gym, sharing a moment after two days of staunchly challenging one another. 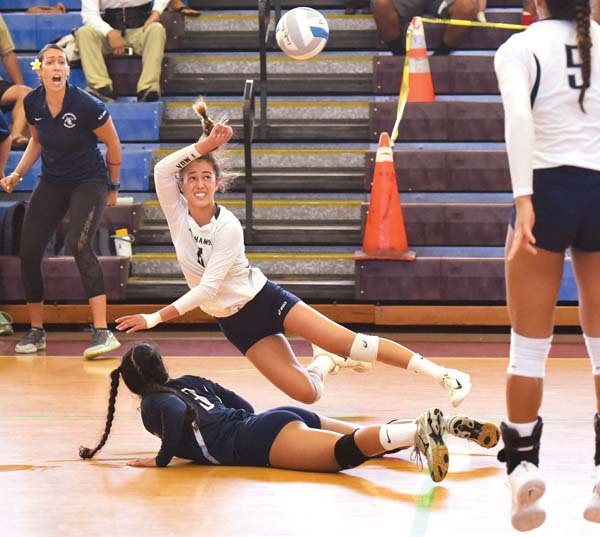 Kamehameha’s Talia Leauanae and King Kekaulike’s Chandler Cowell went toe to toe and kill for kill down the stretch — just as their teams had for more than two hours in the Maui Interscholastic League Division I overall championship match — before Leauanae slammed down the final ball in a 12-25, 25-22, 25-23, 25-27, 15-12 win for the Warriors. Kamehameha (13-1) won the MIL D-I title for the eighth time in 11 years and stopped Na Alii’s three-year reign. Moments before the decisive point, Leauanae required an injury timeout because of cramps in her lower leg and a pulsating headache. Both teams will be in the state tournament this week — King Kekaulike (9-6), which got 16 kills, 14 digs and two blocks from Cowell, will host a first-round match Monday against Mililani, while the Warriors are seeded third and will play a quarterfinal on Thursday in Honolulu against the winner of Monday’s match between Iolani and Waianae. Saturday’s overall championship match was necessary after Na Alii’s four-set win in the MIL tournament final Friday. Alea Cervantes had 14 kills and 18 digs for Kamehameha, Kimani Fernandez-Roy finished with seven kills, Jasmine Corn had 12 digs and Inez Garcia had three aces. The Warriors needed just about all of them. 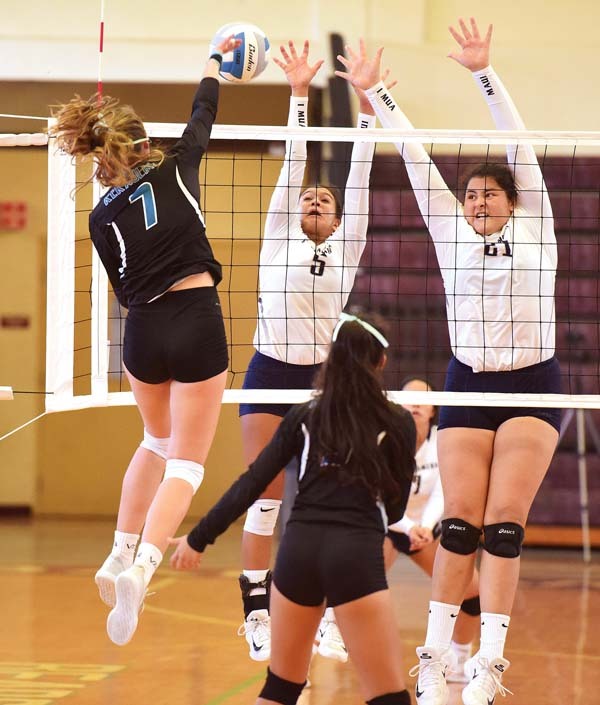 King Kekaulike’s Nina Macphetridge had 14 kills, five digs and two blocks, Brooklynne Albrecht had 10 kills and Lauren Albrecht had 25 assists, three aces and 10 digs. 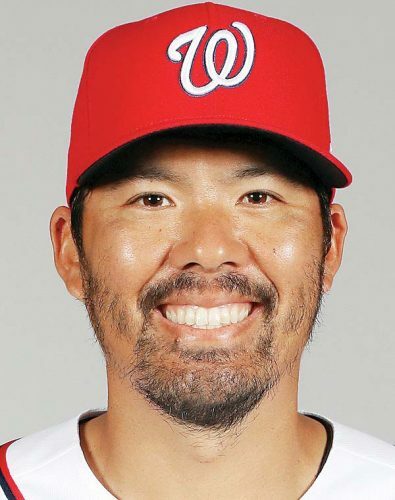 The final set was tied after every other point from 6-6 to 12-12. A kill by Leauanae gave the Warriors a 13-12 lead before Fernandez-Roy had a block, and Leauanae then smacked her kill down the line. Na Alii, who recently got Macphetridge and Cowell back from injuries but are still without Kalena Vaivai and Shaina Rapanot-Uyechi, will have today off before getting back to work Monday.